Tibiocalcaneal fusions (TCF) present a challenge to Foot and Ankle Surgeons, as they are often performed in the setting of severe deformity or infection. 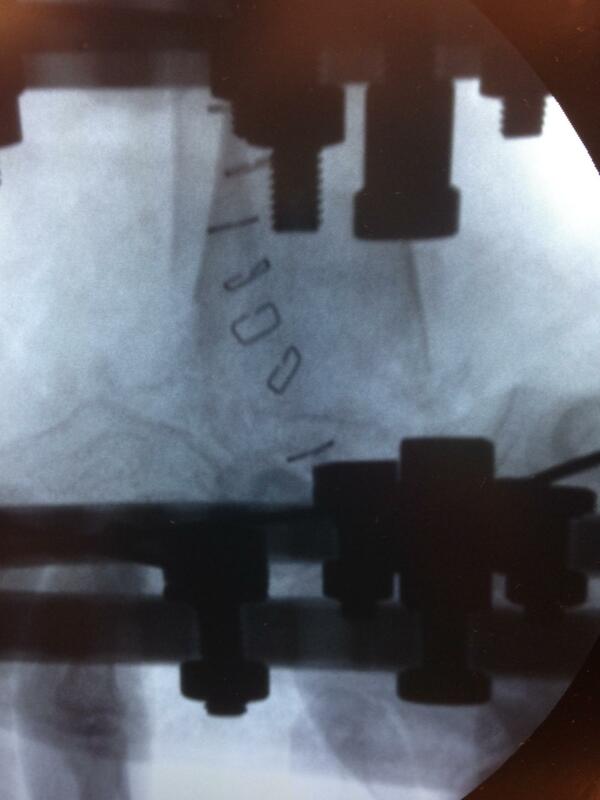 We present a novel peg-in-hole technique for TCF supplemented by Ilizarov external fixation performed on 52 patients. Indications for this procedure include Charcot neuroarthropathy, infection, avascular necrosis, and total ankle replacement failure. Fusion was achieved in 86% (45/52) of patients with an average osseous healing time of 17 weeks as determined by radiograph and CT scan. Complications occurred in 20/52 patients, 7 from dehiscence of the incision and 13 from non-union. Ultimately 3 patients with nonunion underwent below-knee amputation. Despite the technical difficulty of this procedure, we present the peg-in-hole TCF as a useful option for limb salvage in patients with complex pathologies. Tibiocalcaneal fusions (TCF) are end-stage procedures performed for limb salvage due to a host of etiologies. Most commonly cited are those due to Charcot neuroarthropathy (CN), infection or osteomyelitis, for patients who have sustained severe trauma to the talus, and avascular necrosis (AVN) of the talus [1-14]. More modern indications such as total ankle replacement (TAR) revision have become more common due to increased prevalence and popularity of these procedures that involve resection of a large portion of the talus [8,15]. The concept of ankle fusion was first described by Albert in 1879, and many variations have been developed in the following 136 years . Tibiocalcaneal fusion is often the option of choice when there is an insult to a critical component of the ankle mortise; the talus. While many of these procedures come about as dictated by necessity, they are not without their own technical challenges and post-operative complications. Poor vascular supply from trauma or infection coupled with the metabolic imbalance of diabetes can bring bone healing and fusion site stability into question. This is why in many instances, external fixation via an Ilizarov frame, albeit a more technically demanding procedure, offers patients benefit over other more conventional techniques. The Ilizarov external fixator is a valuable construct for its ability to deal with a wide variety of pathologies. It is a preferred method of fixation in the presence of infection, and allows for stability across segments of questionable bone quality, which is often found in patients with medical comorbidities such as diabetes, renal disease, and osteoporosis. Many studies have been performed which document the complications following TCF with an external fixator, most notable for delayed union, malunion and nonunion, wound complications and pin tract infection, re-fracture of fusion site, need for frame adjustments, pain, and poor functional outcome [1-9]. The authors present a new technique for tibiocalcaneal fusion via peg-in-hole fusion using the Ilizarov external fixation method on 52 patients. It is our hypothesis that by increasing the surface area of prepared boney sites between the tibia and calcaneus, there will be faster fusion rates, and an acceptable overall fusion rate. A retrospective review of patient charts was performed from the podiatric clinics of the two leading authors (E.R. and B.H.) from June 2006 through December 2011. Inclusion criteria included patients of any age who underwent peg-in-hole TCF with the use of Ilizarov external fixation. There were no exclusion criteria. A total of 52 patients were identified to meet these criteria with a mean age of 47 years (range 32-67 years), 13 female and 39 males. Patients underwent TCF for four main indications: infection, CN, AVN, and TAR explantation. With the patient in a supine position and under general anesthesia, the procedure began with distal leg exposure via a curvilinear lateral ankle incision at the level of the fusion site. The talus was fully excised including the head and neck. The infected bone, or demineralized bone in the case of CN, was resected to healthy, bleeding bone. A peg was fashioned out of the remaining distal tibia in the shape of a sagittal chevron (apex inferior) by a tapering cut (see Fig. 1, 2, and 3). Figure 1 Intra-operative picture of V-shaped osteotomy to tibia. Figure 2 Intra-operative anteroposterior ankle x-ray of peg-in-hole tibiocalcaneal fusion on a patient. Figure 3 Intra-operative lateral ankle x-ray of peg-in-hole tibiocalcaneal fusion. The corresponding hole was then created in the residual calcaneus by matching the tapered cut made in the tibia. Ultimately the anterior surface of the tibial peg articulates with the navicular and cuboid, and the posterior surface with the body of the calcaneus. Attempt to preserve the fibula was made. In cases where this was unsuccessful, the fibula was resected and discarded. Once adequate apposition was achieved between the tibia and calcaneus, bone marrow aspirate harvested from the proximal tibia was placed within the fusion site. Next the application of the external fixator was performed using the Ilizarov technique. The constructs varied slightly based on necessity as determined by the surgeon, however the main construct included a distal tibial block with two rings, a foot plate, and a half ring on the forefoot (Figures 4 and 5). Figure 4 Medial view of tibiocalcaneal fusion on sawbones. Figure 5 Lateral view of tibiocalcaneal fusion on sawbones. In cases of total ankle replacement explantation, there was an additional lengthening done at the distal tibial epiphysis. The use of skinny wires and or half pins were performed as per judgment of the surgeons. No internal fixation was used. The incisions were closed primarily and compression applied at the fusion site immediately if the distance of shortening was less than 2cm. If the amount of shortening created was greater than 2cm then compression at the fusion site was performed gradually. The frame was left in this compressed state for a latency period of 12 days, and then distraction of 0.75mm per day was commenced. Standard frame and wound care maintenance was undertaken following the procedure. Patients were allowed to load their extremities with 20% body weight for the duration of having the frame. Mean time to fusion was 17 weeks with an 86% fusion rate in 52 patients, determined by radiograph and CT scan. Complications occurred in 20/52 patients, 7 from dehiscence of the incision and 13 from non-union. Ultimately 3 patients with nonunion underwent below-knee amputation. In our patient population, the average limb length discrepancy was 2.7 cm, which was corrected by 2cm in all cases. Complications encountered in our patient population were 7 patients with wound dehiscence. Two of these healed with local wound care; the remaining 5 required delayed primary closure of the wound. There were 13 patients with a nonunion at the fusion site. Five were infected with 1 infected prior to TCF. Three of these resulted in below knee amputation. The 2 remaining infected nonunions were treated with revision surgery. The remaining nonunions were treated conservatively with bracing. Comorbidities identified prior to surgery were diabetes mellitus (17 patients), smoking (26 patients), and prior surgery (41 patients). We report on a new technique of creating a peg-in-hole type cut not previously described for TCF. A V- type osteotomy has been described in the proximal tibia to correct for tibial varum or valgum, but the purpose was for frontal plane angular correction to alleviate medial or lateral knee compartment arthrosis, not for fusion . 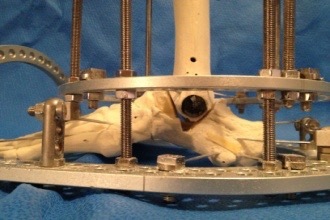 In our technique, the peg-in-hole osteotomy creates a higher surface area of bone contact for fusion, and the addition of an external fixator makes the construct more stable. There are several publications describing TCF with Ilizarov external fixation, which report fusion rates ranging from 75-100%; however, many do not report time to fusion [1-9]. Several recent studies relate their experiences while performing TCF as well as tibiotalar fusion (TTF). Once such study by Kugan et al revealed time to fusion of 26 weeks in those with infection and 19 in those without for both TCF and TTF . They did not elucidate bone preparation technique beyond removal of infected areas to expose healthy bone. Their overall fusion rate was 67% in those with TCF. Another study examining both TTF and TCF was a prospective study by Ashraf, et al which found an 87.5% fusion rate for their TCF patients; however, time to fusion was not specified . Their reported average time in a frame was 6.5 months for both groups. Bone cuts were oriented transversely to accommodate for axial load. Finally, in McCoy et al report on outcomes of TCF and TTF following ankle arthroplasty explantation, they boast a fusion rate of 100% of those with TCF. They too failed to describe their preparation of the bone, or report their time to fusion. It was reported that those in the TCF group were in frames for 212 days on average . Other studies focused on TCF alone have demonstrated healing rates above 75%. Rochman et al on TCF in the setting of talar infection showed a fusion rate of 81%, but did not report a fusion time. The patients were in the frame for an average of 7 months; planar resection was performed at the fusion site . Weber et al reported a fusion rate of 100% for TCF, but did not report on time to fusion. The frame was on for an average of 12 months. Planar resection of the fusion site was performed as well . Dennison et al evaluated TCF for AVN of the talus reported a fusion rate of 100%, but failed to report time to fusion. The frame remained in place for a mean of 10.7 months; however, differentiation of frame removal time was made for patients with proximal corticotomy and lengthening with mean frame removal at 11.5 months versus patients who did not have a proximal corticotomy with lengthening with mean frame removal at 9 months. Planar resection at the fusion site was performed with this group as well . Johnson et al fusion rate was reported at 75% at a mean of 7 months. Planar resection was also performed in their TCF group . Hamed et al reported a 100% fusion rate. However, further differentiation reveals in 3/6 of the cases the foot plate was removed at 15-25 weeks for successful fusion and the remaining frame was left on to complete the tibial lengthening. They did not discuss further breakdown of the time to fusion in the remaining three patients, but states the remaining frame was left in place for an additional 14-50 weeks . Ultimately, three studies [2,5,9] listed fusion times, which ranged from the shortest of 15 weeks (one study) and as long as 7 months. The patients within our study were evaluated for healing with radiographs along the course of their treatment. Once healing was demonstrated on plain films, a CT scan was obtained to confirm this before frame removal was scheduled. Our study demonstrated a relatively short healing time of 17 weeks on average. In the case of TCF, there is often either infected soft tissue or damaged soft tissue from trauma or prior surgery. One main advantage of using external fixation is minimal invasiveness to the soft tissue envelope surrounding the surgical site. In patients who have sustained a severe talar injury or infection, there are usually surgeries performed previously. Thus primary and iatrogenic injury to the soft tissues or copious scar tissue makes dissection tenuous at best. Dennison et al reported a mean of five operative procedures proceeding end stage correction in his cohort of six patients . Hamed et al stated that in his patient group of six, patients averaged three operative procedures prior to the TCF . Ashraf et al reported six of their eight patients had previous surgeries . In relation to total ankle replacement explantation, McCoy et al reported five of their seven patients had previous surgeries . Rochman et al advocates the use of external fixation over internal fixation when there is severe talar injury or necrosis . Likewise, external fixation is useful in the setting of infected bone. It allows surgeons to avoid placing foreign bodies, such as those utilized with internal fixation, into areas of infection. Poor bone stock from infection or other disease states does not allow for rigid, stable internal fixation. External fixation may be placed at a distance from soft bone and allow for a stable construct with superior compression. A result of TCF is residual limb length discrepancy (LLD). In the studies evaluated, there was noted to be significant shortening of the affected limb [1-3,5-9]. By using external fixation and placing a proximal tibial block, many authors were able to correct for the residual LLD by monofocal proximal tibial distraction osteogenesis. Rochman et al averaged 4cm of lengthening in their patient population . Dennison’s patient group averages 3.5cm of lengthening . Kugan et al performed limb lengthening in patients with a >3cm discrepancy, and 100% achieved length equality . Status-post total ankle explantation resulted in large defects from 3.7-8.5cm, and the study by McCoy et al gained a mean of 4.6cm with their procedure . In our patient population, the average limb length discrepancy was 2.7 cm, which was corrected by 2cm in all cases. The authors report a new technique for tibiocalcaneal fusion using a peg-in-hole osteotomy at the fusion site with external fixation using the Ilizarov technique. We feel that this is a technically demanding procedure that has the potential for delayed healing. However, by using the Peg-in-Hole method with external fixation, the foot and ankle Surgeon is maximizing the biological and anatomical properties of bone to allow for improved healing and better functional results. As with any reconstructive surgery, the risk of catastrophic surgical failure ending in below knee amputation is high. However, given the deformity present in our patient population, we feel attempt at limb salvage outweighs the risk of going onto a below knee amputation. Furthermore, the technique proposed provides distinct advantages over previously described techniques, and further studies would help reveal the applications of our novel technique of TCF. Rochman R, Hutson JJ, Alade O. Tibiocalcaneal Arthrodesis Using the Ilizarov Technique in the Presence of Bone Loss and Infection of the Talus. 29(10): 1001-8, 2008. Johnson EE, Weltmer J, Lian GJ, Cracchiolo A. Ilizarov Ankle Arthrodesis. Clin Orthop Relat Res. 280: 160-9, 1992. Dennison MG, Pool RD, Simonis RB, Singh BS. Tibiocalcaneal fusion for avascular necrosis of the talus. JBJS-Br. 83-B(2): 199-203, 2001. Weber M, Schwer H, Zilkens KW, Siebert CH. Tibio-calcaneo-naviculo-cuboidal arthrodesis: 6 patients followed for 1-8 years. Acta Orthop Scand 73(1): 98-103, 2002. 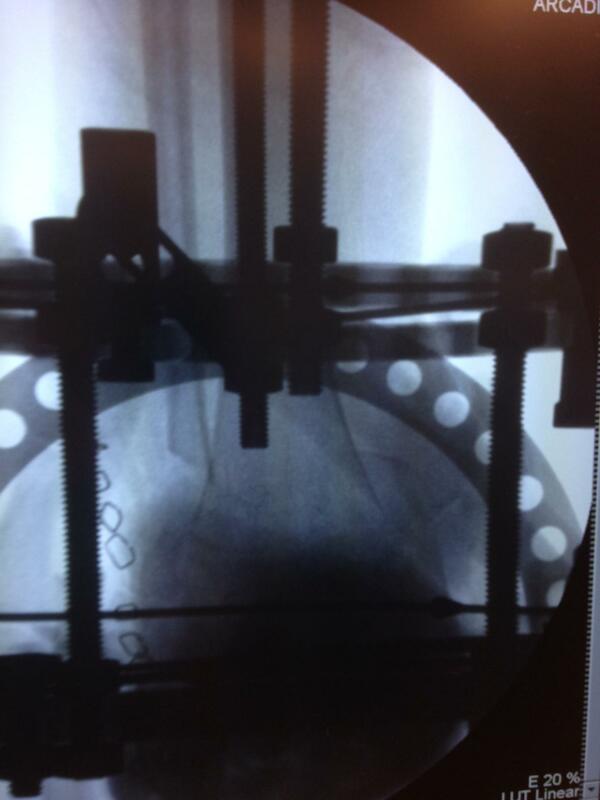 Hamed K. Long-term Results With the Ilizarov Technique for Tibiocalcaneal Fusion. Feb 31(2): 130, 2008. Ashraf AK. Versatility of Ilizarov technique in difficult cases of ankle arthrodesis and review of literature. Foot and Ankle Surgery. 19:42-27, 2013. 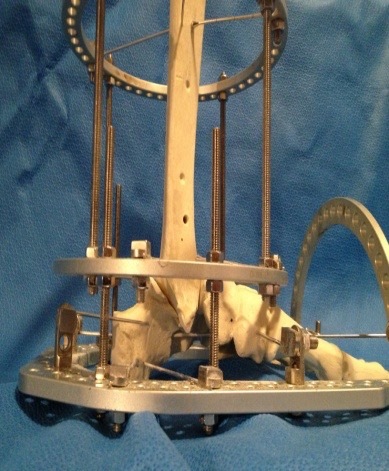 McCoy TH, Goldman V, Fragomen AT, Rozbruch, SR. Circular External Fixator-Assisted Ankle Arthrodesis Following Failed Total Ankle Arthroplasty. FAI.33(11): 947-955, 2012. Kugan R, Aslam N, Bose D, McNally MA. Outcome of arthrodesis of the hindfoot as a salvage procedure for complex ankle pathology using the Ilizarov technique. The Bone & Joint Journal. 95-B(3):371-377, 2013. Kolker D, Wilson MG. Tibiocalcaneal Arthrodesis After Total Talectomy for Treatment of Osteomyelitis of the Talus. 25(12): 861, 2004. Myerson MS, Alvarez RG, Lam PWC. 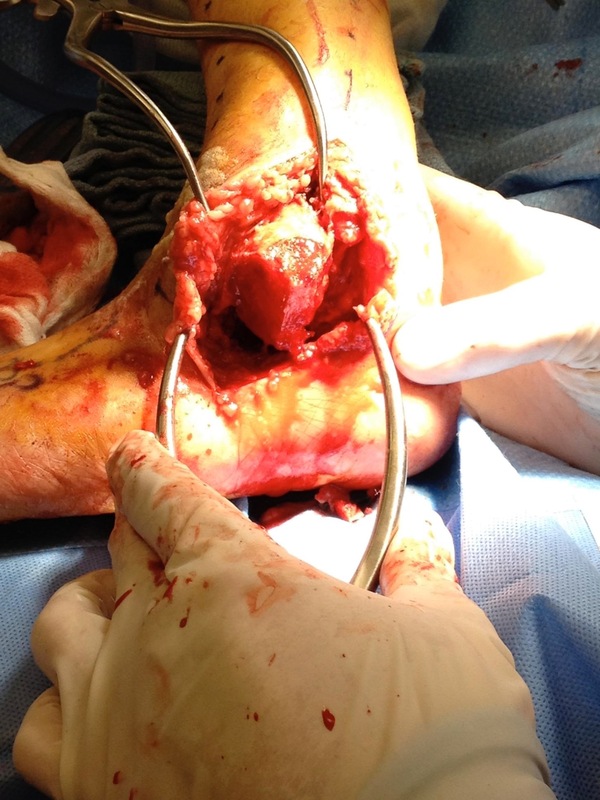 Tibiocalcaneal Arthrodesis for the Management of Severe Ankle and Hindfoot Deformities. 21(8): 643, 2000. Cinar M, Derincek A, Akpunar S. Tibiocalcaneal Arthrodesis with Posterior Blade Plate in Diabetic Neuroarthropathy. 31(6): 511, 2010. Mann RA, Chou LB. Tibiocalcaneal arthrodesis. FAI. 16:401, 1995. Kilen TA, Donnelly RE, Gehrke JC, Werner ME, Johnson KA. Tibiotalocalcaneal arthrodesis with an intramedullary device. 15:669, 1994. Raikin SM , Rasouli MR, Expandar R, Maltenfort MG. Trends in Treatment of Advanced Ankle Arthropathy by Total Ankle Replacement or Ankle Fusion. FAI. 35(3):216-224, 2014. Albert E. Beitrӓge zur operative chirugie. Wien Med Presse 1879; 20:705-8. Madadi Firooz, Eajazi A, Madadi Firoozeh, Behseli LD, Rokni R, Abbasian MR, Bigdeli MR. Clinical Results of Reversed V-shaped High Tibial Corticotomy with Minimally Invasive Surgery Without Internal Fixation Devices. June 33(6): 388, 2010.